This is an update of previous reports with some new analysis at the end. 26% of wives earn more than their husbands (up from 15% in 1990 and 7% in 1970). The average wife-who-earns-more takes home 69% of the couple’s earnings. The average for higher-earning husbands is 79%. It is 8.3-times more common for a husband to earn all the money than a wife (18.7% versus 2.3%). Actually, this triplet pattern fits a lot of trends regarding gender inequality: yes, lots of change, but most of it decades ago, and not quite as fundamental as it looks. A key point here is that although wives rarely earn the dominant share of income, most couples rely on the wife’s income to maintain their standard of living. 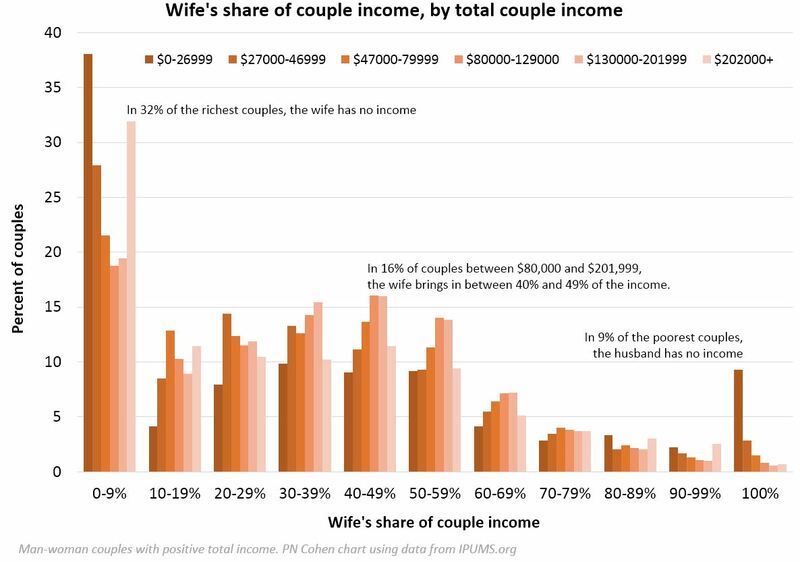 For example, a couple at the median, $80,000, would have to drastically alter their lifestyle without the 40-49% share contributed by the wife’s income. Breadwinning in its 1950s connotation is is distracting from this contemporary reality, and we should probably drop the term. In a previous post I showed that generalizations about Asian-American incomes often are misleading, as some groups have above-average incomes and some have below-average incomes (also, divorce rates) and that inequality within Asian-American groups was large as well. In this post I briefly expand that to show breakdowns in individual earnings by gender and national-origin group. The point is basically the same: This category is usually not useful for economic statistics, and should usually be dropped for data on specific groups when possible. The figure, using the Current Population Survey (CPS), shows Asian men earning about 14.5% more per hour than White men, and Asian women earning 11% more than White women. This is not wrong, exactly, but it’s not good information either, as I’ll argue below. The CPS data is better for some labor force questions (including wages) than the American Community Survey, which is much larger. However, it’s too small a sample to get into detail on Asian subgroups (notice the Pew report doesn’t mention American Indians, an even smaller group). To do that I will need to activate the ACS, which is better for race/ethnic detail. Although changes have not been announced, it is likely that future questions will combine the race and Hispanic-origin questions, and also preface the Asian categories with the umbrella term. This may mark the progress of getting Asian immigrants to internalize the American racial classification system, so that descendants from groups that in some cases have centuries-old cultural differentiation start to identify and label themselves as from the same racial group (who would have put Pakistanis and Japanese in the same “race” group 100 years ago?). It’s hard to make this progress, naturally, when so many people from these groups are immigrants — in my sample below, for example, 75% of the full-time, year-round workers are foreign-born. The problem with the earnings chart Pew posted, and which Charles Murray loved, is that it lumps all the different Asian-origin groups together. That is not crazy but it’s not really good. Of course every group has diversity within it, so any category masks differences, but in my opinion this Asian grouping is worse in that regard than most. If someone argued that all these groups see themselves as united under a common identity that would push me in the direction of dropping this complaint. In any event, the diversity is interesting even if you don’t object to the Pew/Census grouping. Here are two breakouts. The first is immigration. As I noted, 75% of the full-time, year-round workers (excluding self-employed people, like Pew does) with an Asian/Pacific Islander (Asian for short) racial identification are foreign born. That ranges from less than 4% for Hawaiians, to around 20% for the White+Asian multiple-race people, to more than 90% for Asian Indian men. It turns out that the wage advantage is mostly concentrated among these immigrants. Here is a replication of the Pew chart using the ACS data (a little different because I had to use FTFY workers), using the same colors. On the left is their chart, on the right is the same data limited to US-born workers. But generalization has consequences, so we should use it judiciously. In most cases “Asian” doesn’t work well. It may make more sense to group people by regions, such as East-, South-, and Southeast Asia, and/or according to immigrant status. Here’s a quick addition to some old posts on breadwinners (here and here). 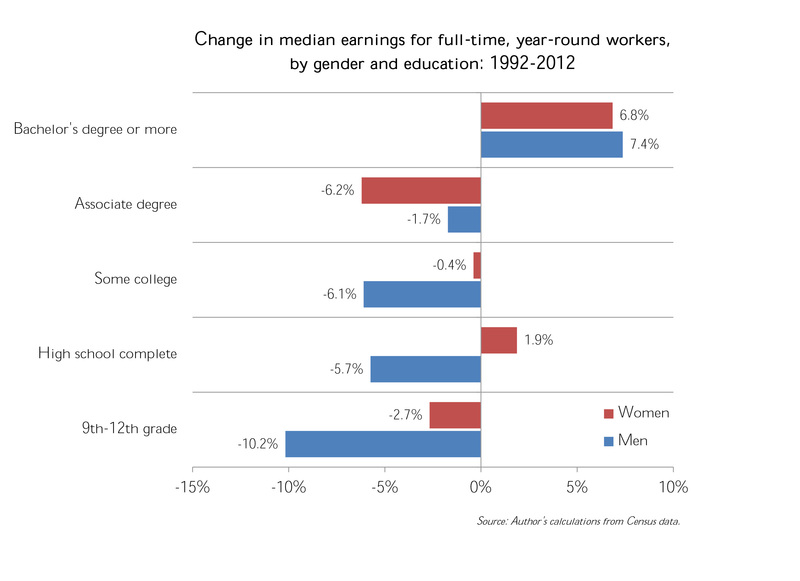 Nowadays, women are much more likely to earn more income than their husbands do. But this is a shift, not a revolution, because very very few women are the kind of breadwinner that men used to be. In 2014, 25% of wives earn more than their spouses (up from 15% in 1990 and 7% in 1970). The average wife-who-earns-more takes home 68% of the couple’s earnings. The average for higher-earning husbands is 82%. In 40% of the wife-earns-more couples, she earns less than 60% of the total, compared with 18% for husbands. It is almost 9-times more common for a husband to earn all the money than a wife (19.6% versus 2.3%). * I forgot that in 0.5% of the 2014 cases the wife’s spouse is also a woman, so it would be more accurate to replace “husband” with “spouse” in the facts that follow. Had marriage rates not declined substantially among parents, many more families would have attained middle-class incomes, and the inequality across families would have increased at a slower rate. It’s possible marriage increases income inequality in general. It’s also possible that people don’t get married as much when they’re not worried about inequality. 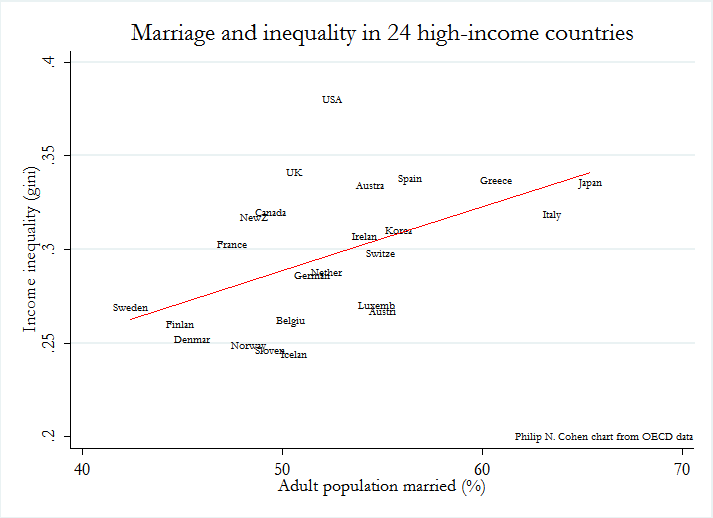 Regardless, this shows high marriage rates are quite compatible with high inequality. Falling marriage does contribute to rising inequality in the USA, because of how it’s manifesting: increasing selectivity in marriage, so that richer people are getting and staying married more; and increasing social class endogamy, so that there are more two-high-income families lording over more one-low-income families. And all of that is exacerbated by widening underlying inequality, with high-end incomes pulling away from low-end incomes, relatively unchecked by income redistribution. One obvious solution is to take money away from married high-income people and give it to single low-income people. With all the benefits that married people get — many of them through no special effort of their own, but rather as a result of their social status at birth, race, health, good looks, legal perks, or lucky breaks — it seems reasonable to tax marriage, like a windfall profits tax, or an inheritance tax, or a progressive income tax. But, if you’re squeamish about taxing something “good” like marriage, then just taxing wealth a little more would accomplish much the same thing. This elegant solution would decrease inequality, increase well-being for poor people, and equalize life chances for children (who are the future, I believe). In other words, it’s out of the question. A second, less-obvious (but more-often mentioned) solution is more marriage. Low-income single people could become high-income married people. Or, failing that (which they would) they could settle for becoming low-income married people. Besides the fact that efforts to promote marriage have been a complete failure, would this even make poor single people and their children better off? The family science right-wing establishment says Yes. To the poor singles, they say: “See how well married people are doing? Get married and you’ll be like them (also: you won’t get raped so much, you sluts. )” To their rich donors and political allies, they say, “Make them earn their benefits by demonstrating their moral fiber and manning up.” The welfare reform attempted this, and successfully forced many single mothers into the labor force in the cause of character development — but it failed in its goal of marrying them off. So more marriage is the new agenda — and the family right has a plan that leads inexorably to success (for them): either by successfully raising marriage rates among the poor (extremely unlikely), or by justifying the continued denial of basic welfare to the poor and shoring up the political case against economic redistribution (extremely likely). Question: Why should we think the unmarried people would get the same benefits from marriage that currently married people do? If marriage is becoming increasingly selective, then you can’t assume the benefits observed among actually married people would be reaped by those who have been left out (or opted out) of the increasingly stringent marriage selection process. They may not have the assets that lead to marriage benefits — skills of many kinds, wealth, social networks, and so on. Setting aside the completely misleading use of an area chart, and the gruesome y-axis truncation, this shows that married-parent families have had faster than average income growth. One obvious reason for this is women’s rising labor force participation, at least into the 1990s. That has a big effect on income at the median, which is the line this is showing for each group (though the area form makes it look like it’s some kind of distribution). Rising income at the median would reduce income inequality. The fact that single-parent families are dragging down the average contributes to growing inequality and a stagnant overall median. But the top is where most inequality is being generated. Looking at the top will help us see not just growing inequality, but also why getting poor people to get married won’t help them as much as Wilcox and Lerman think it would. 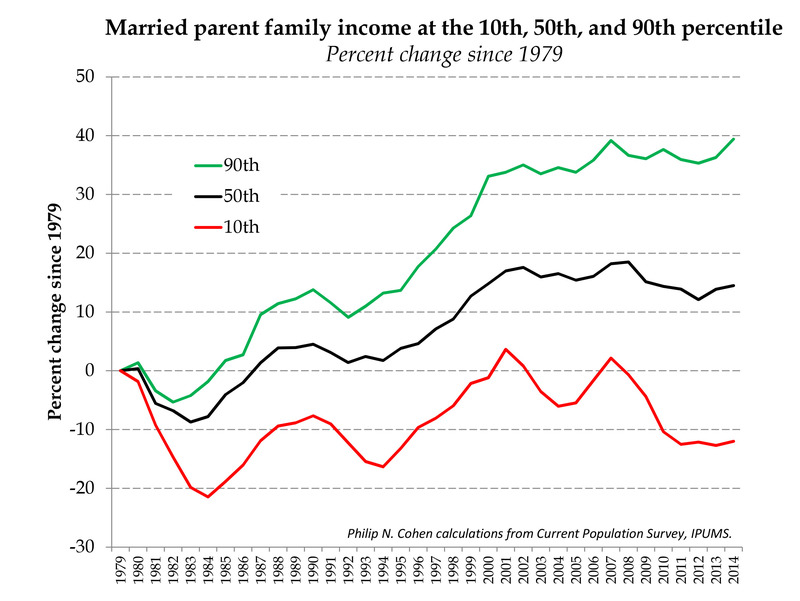 Let’s add the 90th and 10th percentiles to the married parent income trends. My figure shows that the married parent family’s 90th percentile’s income has risen 39% since 1979, while the median has risen 14%. But the 10th percentile’s income has fallen 12%. So, if poor single people finally get with it and start getting married, which married parents are they going to look like? 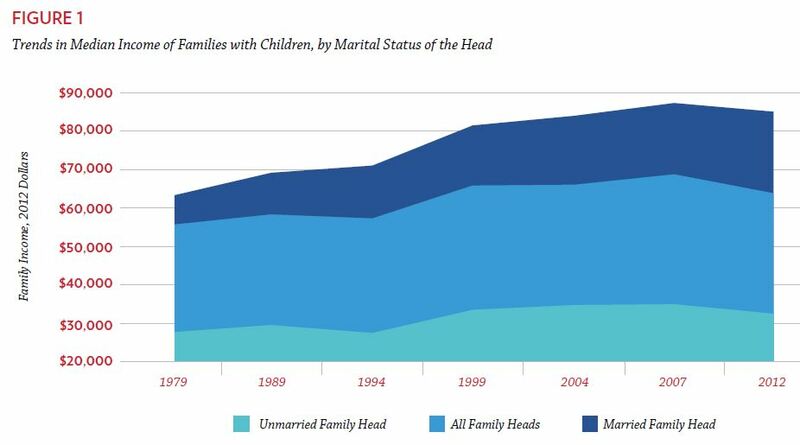 The chart shows dramatically increasing inequality among married-couple families. Pouring more married couples into the bottom of the distribution doesn’t seem likely to fix that. And, as Jordan Weissman pointed out, the family structure story has nothing to do with the huge rise in incomes in the top 1% and .1%, which are central to the inequality story. Till now I’ve skirted some thorny technical issues to make a comparison comparable to Wilcox/Lerman’s data. But assessments of family income inequality are tricky. Marrying two low earners creates one family household with twice the income. That shows up as a rise in incomes per family, but what is the real gain? They get economies of scale, but most descriptions (like Wilcox/Lerman’s) don’t take that into account. And the children might increase their consumption from greater access to the second income, but that’s hidden within the family black box. To see how changes in family income distributions affect children, it’s useful to use a family size adjustment. I like one in here that counts kids as seven-tenths of an adult, and scales the family income by .65. (So you just divide family income by this: [(adults+(.70*kids)).^65].) Now you can track children’s cash on hand much better. I also prefer to use household rather than family income and composition, because the Census definition of families is narrow. In the charts so far, for example, parents’ cohabiting partners’ income is not included. This shows that the increase in family inequality has been much more dramatic for married-couple families than single-parent families. 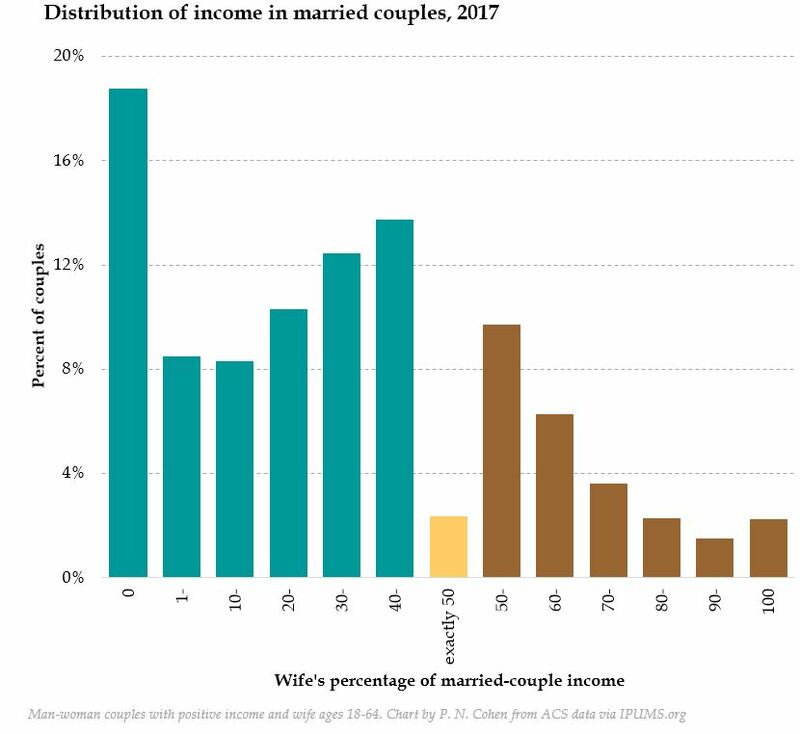 That’s those high-income couples pulling away from the middle and the bottom. On the other hand, inequality has been and remains higher for single-parent families. Note that the inequality for all children is not just the average of the two other lines, because it also includes the inequality between married-couple and single-parent families. 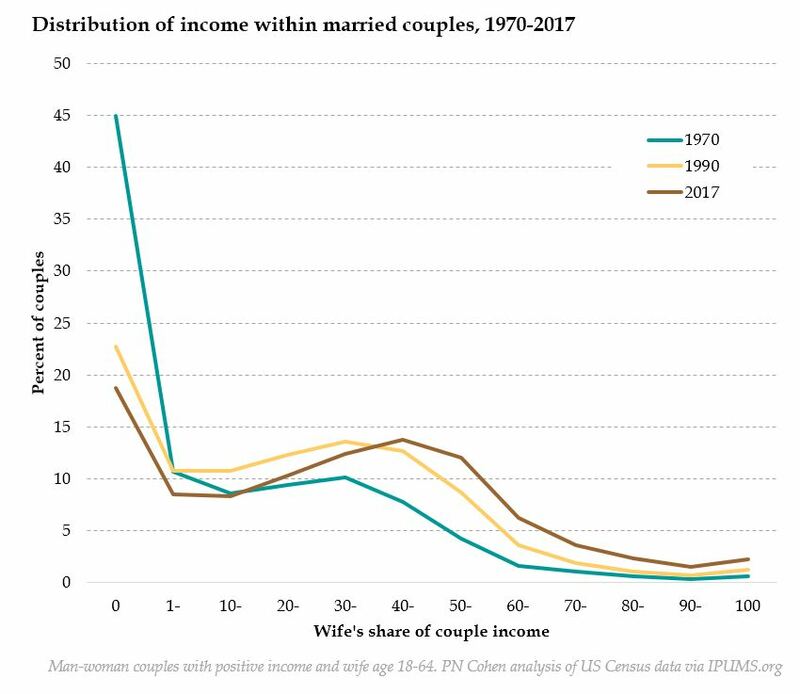 So moving people from single to married would have reduce inequality more in 1980 than now, but just on composition it might still help if it boosted cash per kid through access and efficiency. Whether that benefit would outweigh the costs is not clear. If people not married yet aren’t just like the people who are — they may have lower skills and resources of various kinds, for example — marriage might not facilitate those transfers. Plus, it’s only good if the people want to be married. 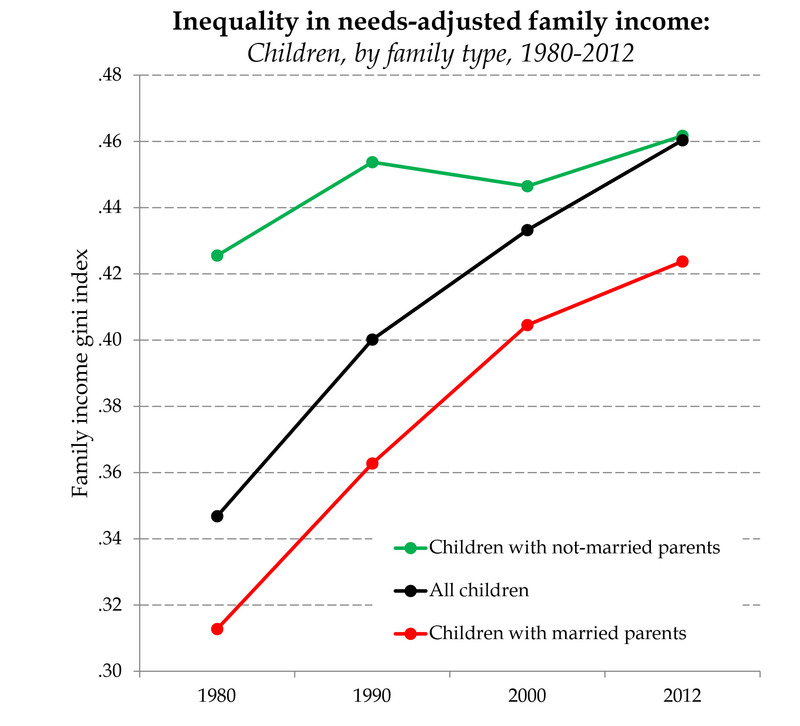 Anyway, point is, married-couple families are doing pretty well at increased income inequality all by themselves. Most of the talk about income inequality is about inequality within countries – between rich and poor Americans, versus between rich and poor Swedes, for example. The new special issue of Science magazine about inequality focuses that way as well, for example with this nice figure showing inequality within countries around the world. But what if there were no income inequality within countries? If everyone within each country had the same income, but we still had rich and poor countries, how unequal would our world be? It turns out that’s an easy question to answer. The World Bank data I’m using includes within-country income distributions broken into 7 quantiles: 5 quintiles (20% of the population each), with the top and bottom further broken in half. If I assume that the income is shared equally within each of these quantiles, I can take those 131 countries and turn them into 917 quantiles (just assigning each group its share of the country’s GNI). These groups range in average income from $0 (due to rounding) in the bottom 10th of Bolivia and Guyana, or $43 per person in the bottom 10th of the Democratic Rep. of Congo, up to $305,800 per person in the top 10th of Macao. 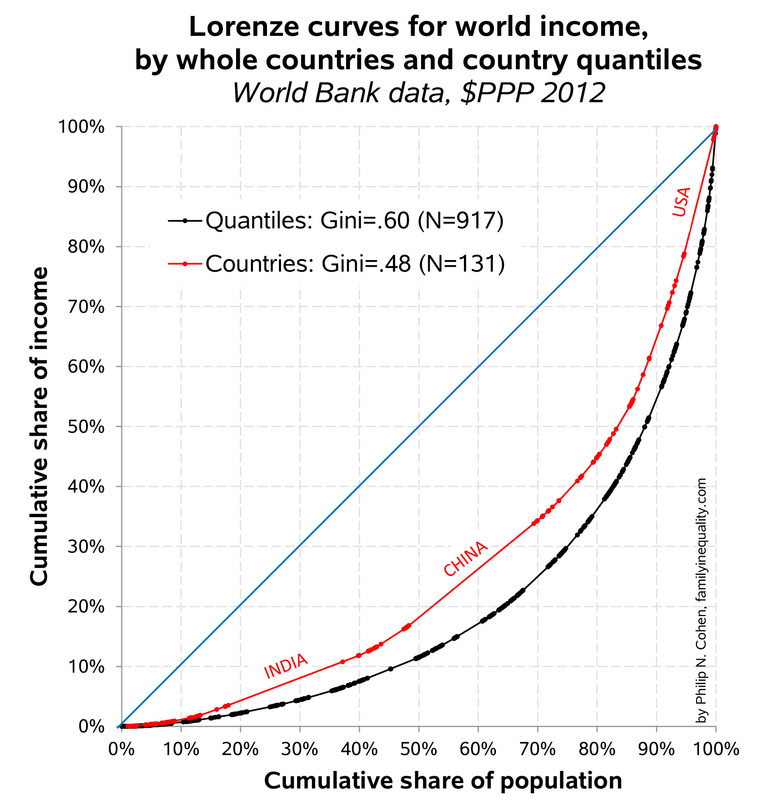 This shows that the average income of China’s top 10th is between the second and third quntiles of the US income distribution, and the top 10th of India has an average income comparable to the US 10-19th percentile range. Obviously, this breakdown shows a lot more inequality. 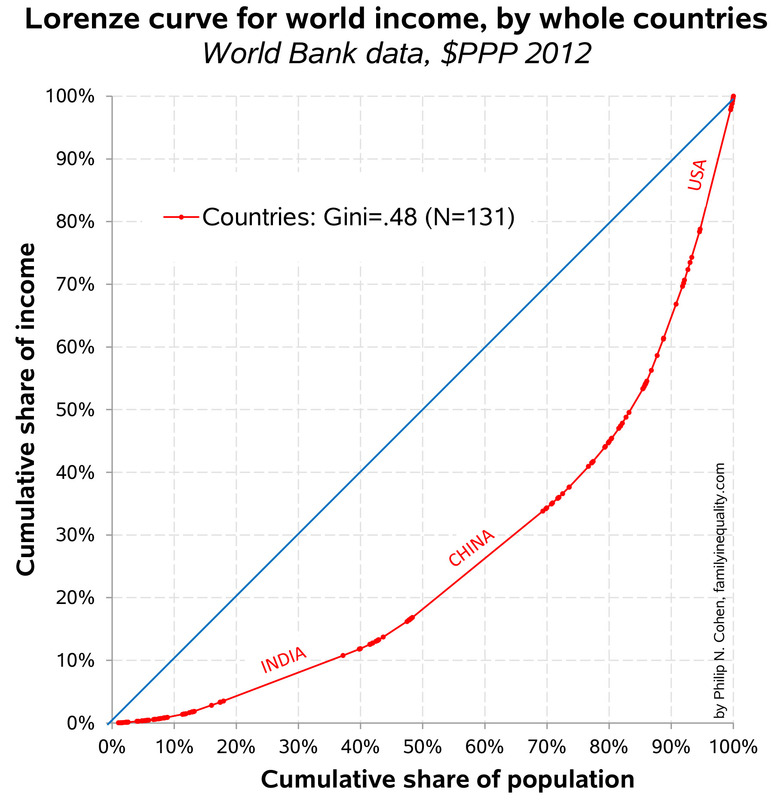 Now the Gini index has risen a neat 25%, to an even .60. Is that a big difference? Clearly, between country inequality — the red line — is vast. 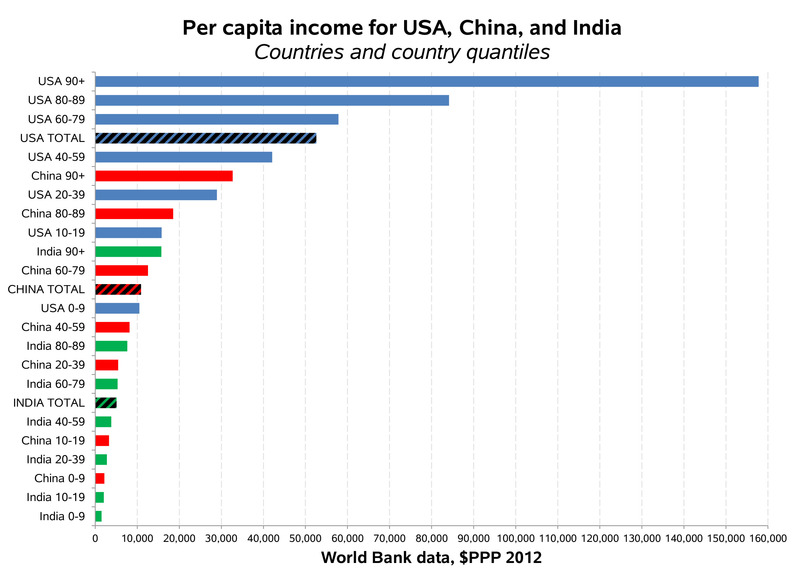 If every country were a household, the world would be almost as unequal as Nigeria. In this comparison, you could say you get 80% of the income inequality to show up just looking at whole countries. But of course even that obscures much more, especially at the high end, where there is no limit. Years ago I followed the academic debate over how to measure inequality within and between countries. If I were to catch up with it again, I would start with this article, by my friends Tim Moran and Patricio Korzeniewicz. That provoked a debate over methods and theory, and they eventually published this book, which argues: “within-country analyses alone have not adequately illuminated our understanding of global stratification.” There is a lot more to read, but their work, and the critiques they’re received, is a good place to start. Note: I have put my Excel worksheet for this post here. It has the original data and my calculations, but not the figures. I have written a brief report for the Council on Contemporary Families, released today, for the 50th anniversary of the War on Poverty declaration by Lyndon Johnson: Was the War on Poverty a Failure? Or Are Anti-Poverty Efforts Swimming Simply Against a Stronger Tide? The suite of social welfare programs introduced or expanded in that era moved millions of people out of poverty and improved the lives of millions more who remained income-poor. In recent years, however, poverty has been rising once again. Focusing on children, our most vulnerable citizens, highlights both the strengths and the limits of our current anti-poverty programs. The high rates of child poverty in America highlight a basic feature about the U.S. system, and its principal vulnerability: ours remains predominantly a market-based system of care. And the multiplication of low-wage jobs that has come with widening inequality is a formidable obstacle to reducing poverty today. Despite frequent claims to the contrary, that government can play a key role in reducing poverty. The rapid rise in nonmarital fertility is arguably the most significant demographic trend of the past two decades. How can we improve the lives of the growing numbers of unmarried mothers and their children? So far, a dominant approach has been to encourage their mothers to marry. The flaw in this argument is the assumption that all marriages are equally beneficial. Our recent research adds to the growing body of evidence that promoting marriage is not the answer to the problems facing single mothers and their children. A more promising approach is to focus on reducing unintended or mistimed births. If the goal of marriage promotion efforts was truly to lower poverty rates and improve the well-being of unmarried parents and their children, then it is time to take a different approach toward this goal. Kudos and thanks to the Council on Contemporary Families (of which I’m a board member) for putting this together, especially Stephanie Coontz and Virginia Rutter, who did the work of coordinating, editing, and distributing the reports. You can’t do it (or much of anything) in one chart. 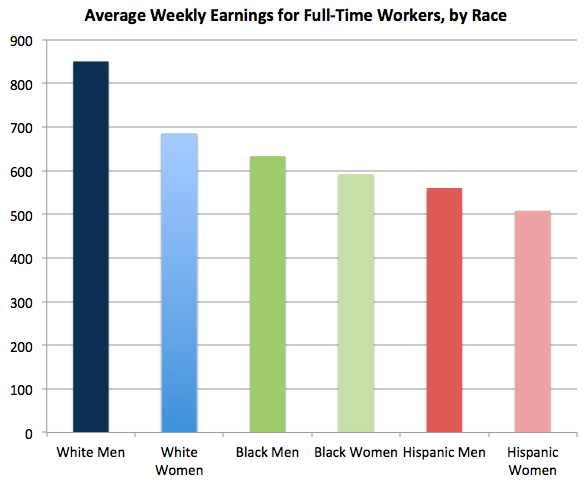 The wage gap itself shows white women earn more than more than black men; that is to say my race is a greater determinant of wage than is my gender. This shows that Black men and White women — full-time, year-round, 25-54 — have the same median earnings if you don’t take into account education. 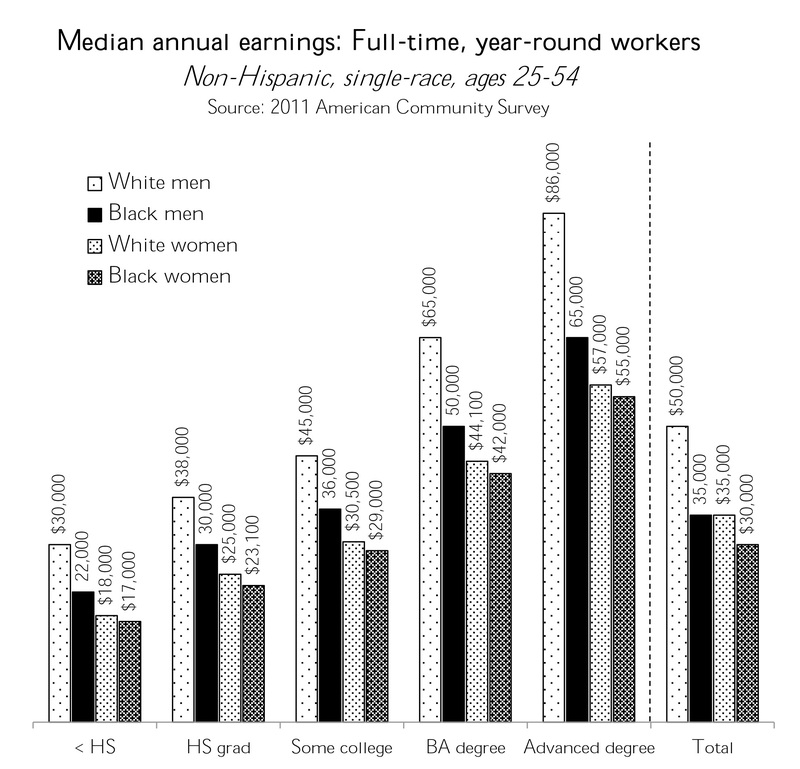 Within each education group, however, Black men earn more. Who gets to be in the full-time, year-round population (instead of dead, incarcerated, unemployed or underemployed), of course, is a big issue. I can’t show that in one chart. I'm a sociologist at the University of Maryland, College Park. See my website for more information. About Charles Murray: Is a White man’s cross burning as disqualifying as blackface? How about using half the Bezos fortune to stop US child poverty for one year? About Charles Murray: Is a White man's cross burning as disqualifying as blackface? 9 uses of "the ways in which" that should be replaced by "how"